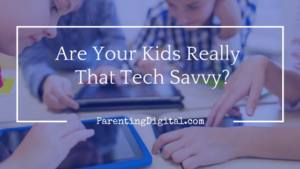 Are your kids really that tech savvy? Of course, we all want our kids to be safe online. That’s a given. Wherever they are, whether online or offline, we want them to be safe and make safe choices. When they are on screens, we don’t want the boogeyman to get them while watching YouTube, or solicited in social media, or cyberbullied in an online game. We focus so much of our effort on online safety. Focusing on filtering and monitoring, we are missing a whole other side to raising kids in a digital world. Safety is only half of it. I want my kids to be safe. I want them physically and emotionally safe, with their bodies, eyes and hearts protected. But I also want them to be tech savvy. I can hear some of you now. Are you kidding? They are savvy enough! They know way more than I do about technology, and they just take to it like a fish to water. We don’t need to teach them anything about how to use technology. And you would be sorely mistaken. Being tech savvy is a far cry from being a “tech junkie” or a “geek”. Being on technology all the time or the ability to learn it quickly is not savviness. Consumption is not skillfulness. I can eat just fine. As a matter of fact, I could plow through a plate of bacon without any assistance. No one has to show me how to shove the bacon into my piehole, or chew, or swallow. I’m a natural. But that doesn’t make me smart about it. Tech savvy is a healthy consumption of technology. It’s knowing when to use tech and when not to, the ability to manage your attention and avoid distraction, and the skill of separating the online wheat from the online chaff. We need to adjust our thinking and attention to the other side of digital citizenship. We must intentionally teach our kids how to navigate and leverage the information, resources, and tools that are available to them. Our kids need to learn how to be their own filter. Self-monitoring is a necessary component of savviness. All the filtering software and monitoring tools can only protect them for so long. Eventually, either for a temporary sleep-over at a friend’s house or a permanent move to college, our filters will not be able to reach them. To teach our kids to be smart online, we need to address three areas of focus. It’s a complex list of things they need to learn, and we need to help them develop these skills. It’s not as easy as slapping a filter onto their devices. Or monitoring their online activity. Or limiting their technology use. Instead, it’s an ongoing, deliberate teaching of these things. It requires reinforcing and encouraging the right behaviors and having open conversations about the wrong ones. Ultimately, the goal is to achieve that “perfect” balance between protecting our kids from the online world while preparing them for the online world. To both keep them safe and teach them to be savvy. That’s a much bigger boogeyman to face.